Great lot of pictures - yes I looked at the whole lot, as I have just added you to my list of Friends. Great looking kid, and Will is also so cute. You and Amanda are great parents. 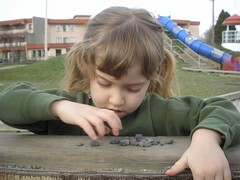 Zoe's playing with rocks :) Im sooo proud of her :) Smart girl she is. Yep! !